In order to add an alert on any event (from the full list of events) you can right-click on "Alerts" window and in the opened context menu select the "Add alert" option. In the opened "Adding alert: Event" window select the event and press "Next" button. Select, for example, the "Target Price Level reached" event, and "Adding alert: Condition" window will open to set properties for that event. 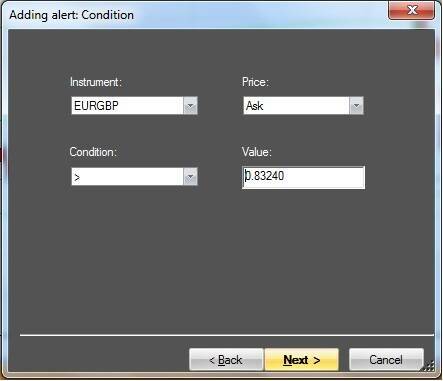 In the current example the alert will sound, when Ask price for EURGBP rises above 0.83240. Press "Next" button and "Adding alert: General properties" window will open. "Finish after the first actuation" option – in the example it is ticked, i.e. the alert will sound after the first actuation of the condition, but later if the price falls below the specified level and again rises above that level, no alert will be. 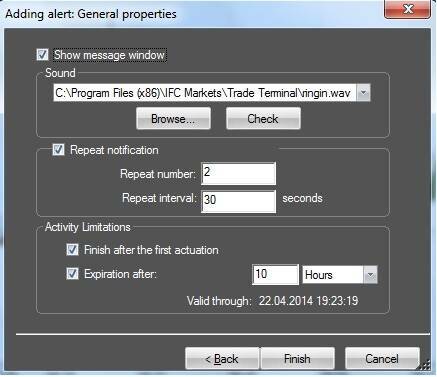 Expiration after – in the example the alert condition is being checked for 10 hours starting from the set moment and then it is removed. Other events in the list of available events are set by corresponding dialogs, which can be viewed in the Full user guide of NetTradeX terminal. In the "Market Watch" window right-click on the financial instrument and in the opened context menu select the "Add alert for price" option. 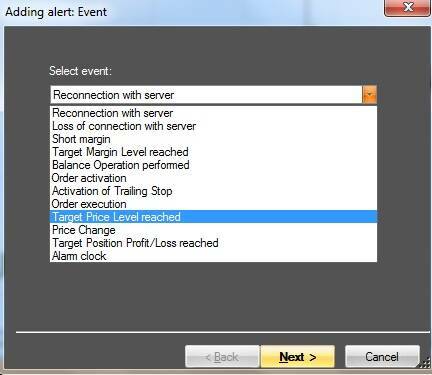 "Adding alert: Event" window will open but you can select only two events: "Target Price Level reached" and "Price Change". Then go through the dialog procedure. In "Open positions" window right-click on the position line and in the opened context menu select the "Add alert to open position" option (there is only one event "Target Position Profit/Loss reached"). 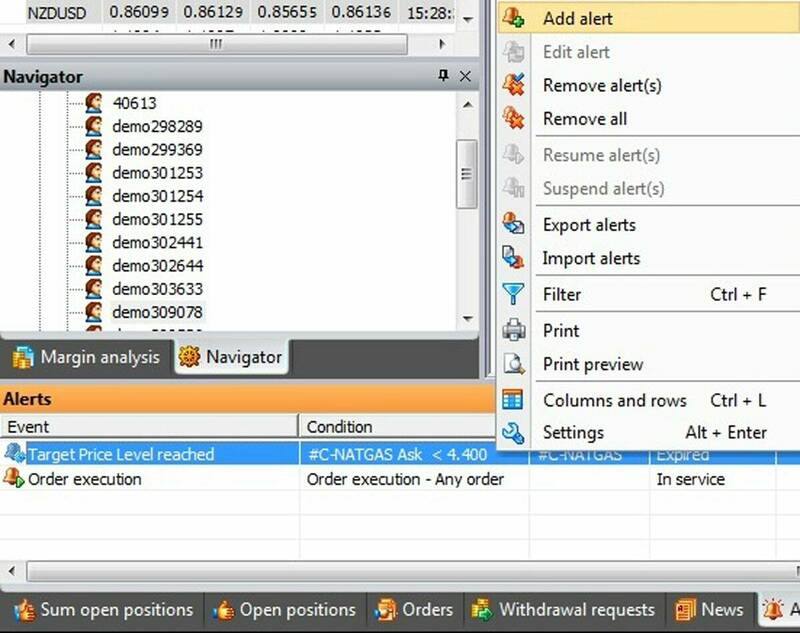 "Adding alert: Condition" window will open where you can choose Conditions and P/L pips. Then go through the dialog procedure (seeFull instructions). In "Orders" window right-click on the order line and in the opened context menu select "Add alert to order" option. "Adding alert: Condition" window will open where you can select only one event "Order execution". Then go through the dialog procedure. The added alerts can be edited, removed, resumed or suspended in "Alerts" window by selecting "Edit alert", "Remove alert(s)", "Resume alert(s)", "Suspend alert(s)” options from the context menu, respectively. You can view the current state of alert in “State” column of “Alerts” window.